Southern Wax Myrtle along the front edge of our garden. Southern Wax Myrtle, Myrica cerifera, makes a beautiful loose hedge across the front of our garden. 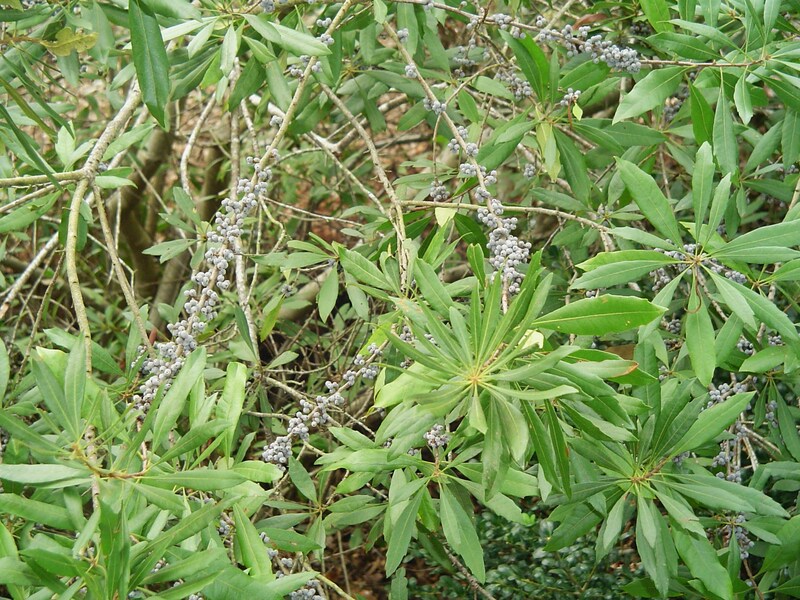 A tough, fast growing evergreen, this shrub is covered in beautiful, dusty blue berries in autumn. The late spring flowers are tiny and white, almost unnoticeable, but the fall berries clothe the stems in soft blue. Myrica cerifera produces beautiful blue berries along its branches each autumn. Growing to 15′ tall and wide, it offers privacy and attracts many species of birds, offering shelter and safe areas to perch. The berries, produced only on female plants, offer migrating birds an important source of food. Growing from New Jersey south to Florida along the East Coast, and then west along the Gulf into Texas, Southern Wax Myrtle is hardy in zones 6-9. Closely related to Northern Bayberry, Myrica pensylvanica which grows in Zones 3-7; it is also fragrant, and its berries can also be boiled to render a waxy substance for use in candle making. Both shrubs can take salt spray and thrive near the coast. 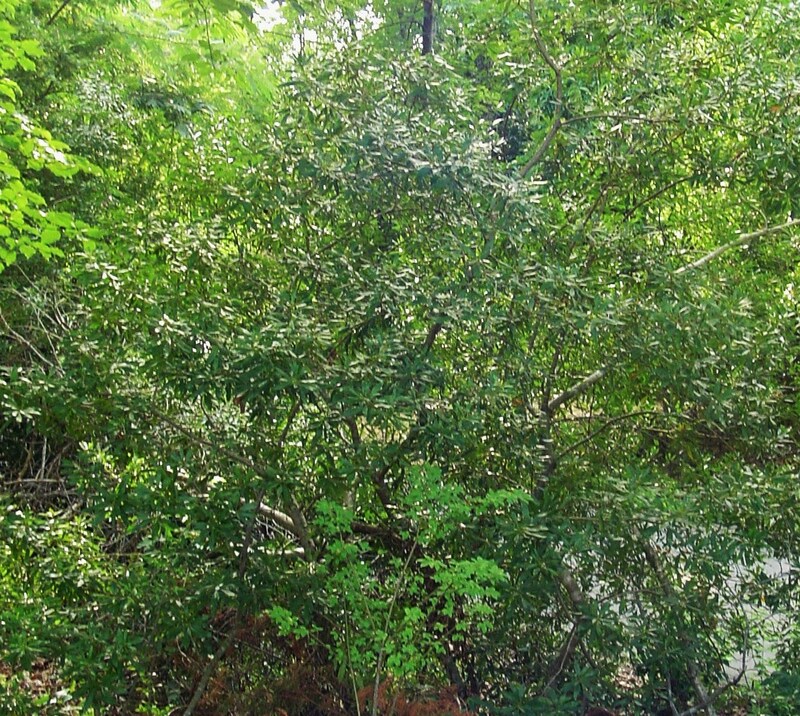 Southern Wax Myrtle grows considerably taller than the Northern Bayberry, and retains its leaves. Northern Bayberry loses many of its leaves during the winter. Both enjoy part shade to full sun. 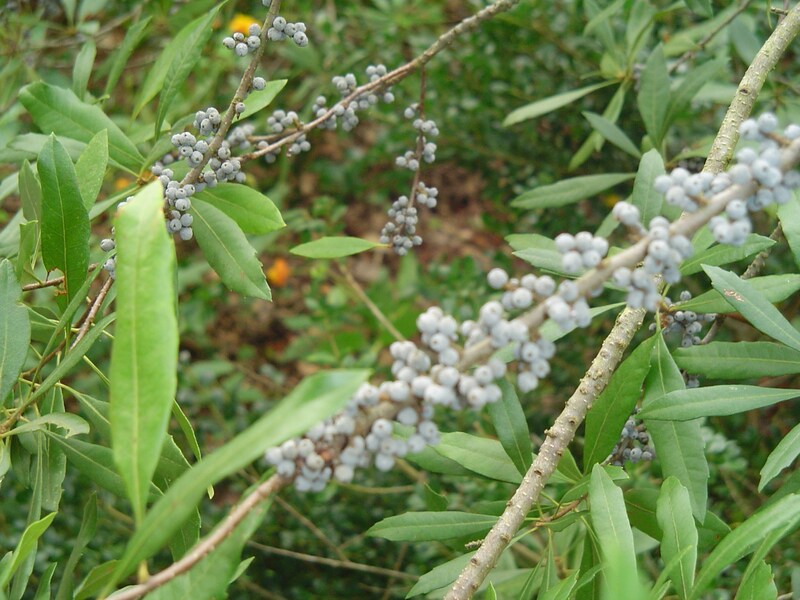 Native Americans and the early settlers used Myraca to treat a number of conditions from diarrhea to fever. Compounds in both the roots and leaves can be used in herbal medicine. Unattractive to deer, this is a reliable grower in the edges of a forest garden. It tolerates a variety of soils from sand to clay, and will grow in areas with low soil fertility. 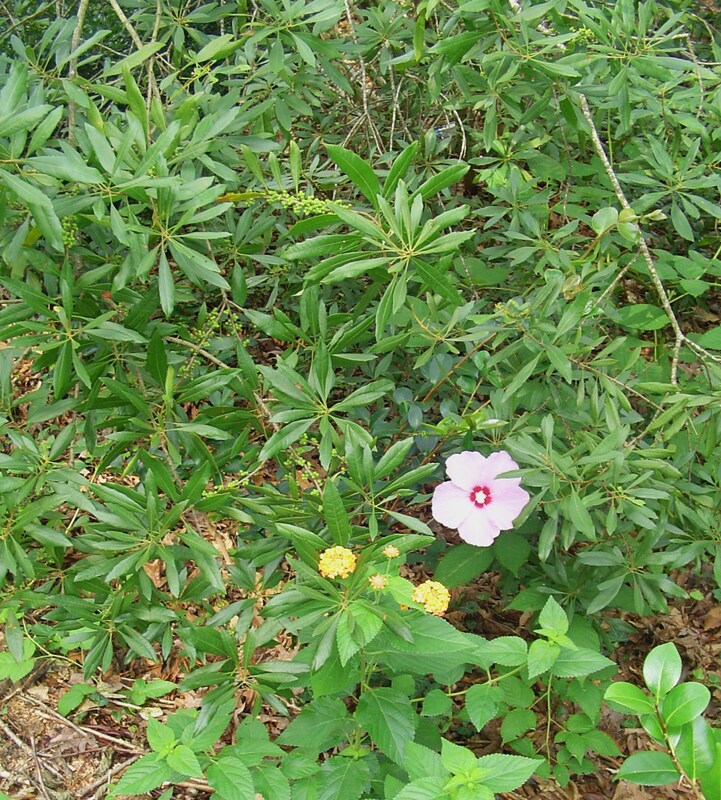 It is one of the first shrubs to colonize a newly cleared area. Its roots fix more nitrogen in the soil than many legumes, and so it actually improves the soil where it grows. it is a thirsty shrub and is happy growing near water, but can tolerate periods of drought. Southern Wax Myrtle will spread by underground roots which sucker, which makes it even more effective as a screening plant or hedge. Finally, this is a good plant to cut for holiday decorations. Although many of the berries may already be eaten by mid-December, branches will last many weeks in a vase with water. Its evergreen leaves will remain fresh looking into the new year. Because of its loose, branchy habit, I like to use it with small glass birds clipped onto the branches. 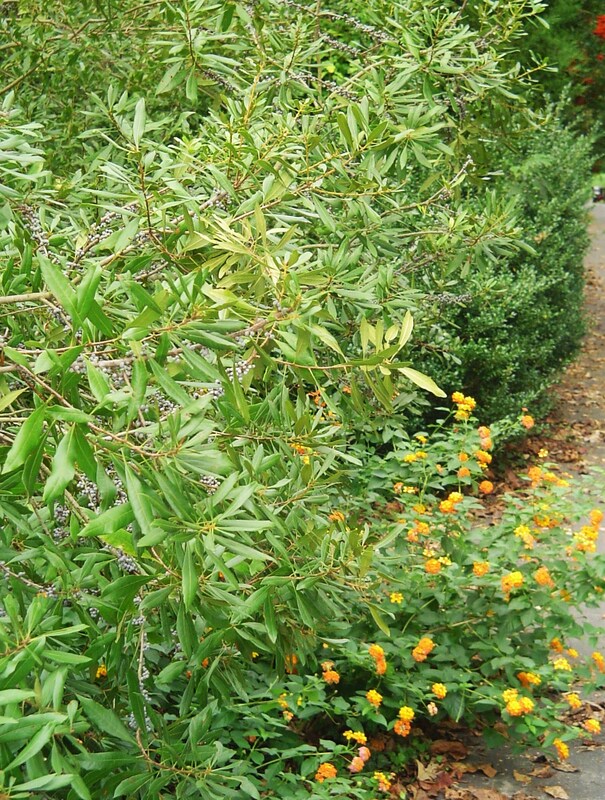 It makes a good filler for flower arrangements, and the the shrub responds well to pruning with new growth in spring. This tough, beautiful, native shrub is an excellent choice for anyone hoping to attract more birds to their garden. Southern Wax Myrtle in August. Southern Wax Myrtle grows as a large shrub or small tree, and grows thickly enough to make a good screen. I am very protective of my ‘female ‘ wax myrtle tree or shrub next to my home in Mobile, Al..In a discussion with next door neighbor explained the importance for ‘our’ tree. I read that the ‘female’ provides the berries .and It is one of the most notable trees in my neighborhood.and enjoyed throughout the year for its long droopy limbs, which are covered with brilliant green leaves .During the fall months the squirrels are seen clambering throughout gathering and one can actually hear and watch them biting off the small branches and apparently chewing or gathering the tiny blue berries. I wonder while watching just how cold it will be this year as they have been very active for over a month and my tree is becoming short on limbs with the yard being covered with dead limbs and debris.The shrub is approximately 25 feet tall with a 20 ‘ diameter and provides an important feeding habitat not only for quite a few squirrels .but a variety of species and thousands of migrating birds filling up before trans migrating the Gulf of Mexico.. A turtle family-husband, wife and child- hibernate in the leaf compost and reappears when it’s time for eating their meal of lettuce. .
An opportunity, and a challenge. Cheers!